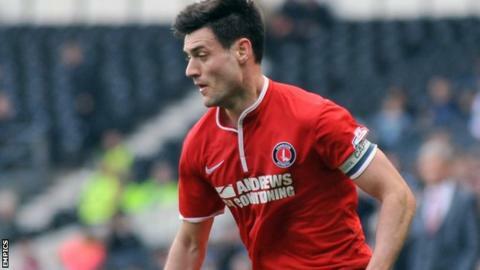 Charlton captain Johnnie Jackson says Tuesday's game against bottom club Barnsley will be key in their bid to avoid relegation from the Championship. The Addicks are currently one point above the bottom three. "Ultimately it is going to be the games against the sides in and around us which define where we end up," the 31-year-old told BBC London 94.9. "Tuesday is the real vital one to push ourselves on and put some distance between us and the teams behind us. Charlton have two games in hand on most of the sides at the bottom of the table. Victory over Barnsley at The Valley would move the Addicks up to 18th in the table, but defeat would lift the Tykes off the bottom and to within two points of the south east London club. "Even a point in the game would push us up a place and it is a game less for the opposition," midfielder Jackson added. "It is an opportunity to go above Blackpool. "Psychologically results went okay for us on Saturday. If we had dropped into the bottom three there would have been more pressure on us. "But that won't affect the way we approach it as we know it is a huge game." Charlton have been playing two games a week for the last month owing to a fixture backlog caused by a series of postponements and their run to the quarter-finals of the FA Cup. The Addicks have won their last four games on a Tuesday night, but on each occasion have lost the following Saturday and Jackson says the squad has found the run of games challenging. "A lot of emphasis is put on recovery between games," the former Tottenham trainee said. "It's been a touch schedule and there is no getting away from it. "It's been four weeks that we have been at it Saturday-Tuesday and it will be that way until the end of the season. "We will have days where physically you will not be at your peak. It will be hard to maintain the levels in every single game as we play so many games in such a short space of time. "We haven't got a huge squad and there are not loads and loads of bodies to count on. "The gaffer [Jose Riga] has to manage his squad and as players we need to do the right things and make sure we are ready for the next game."